Dale Needham, FCPA, MD, PhD, Director of the Outcomes After Critical Illness and Surgery (OACIS) Group at Johns Hopkins University School of Medicine, received an R-24 grant from the National Heart, Lung and Blood Institute (NHLBI). 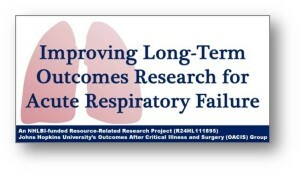 This R-24 project, entitled “Improving Long-Term Outcomes Research for Acute Respiratory Failure” is aimed at creating resources for researchers conducting long-term follow-up of patients surviving acute respiratory failure and acute respiratory distress syndrome (ARF/ARDS). 2) to create and disseminate practical tools for maximizing patient cohort retention for longitudinal long-term outcomes research studies. 3) to create and disseminate statistical tools and programs to appropriately address truncation due to mortality when analyzing long-term functional outcomes in this patient population. The project is in its early stages. The website will continue to be updated as the project progresses. If you have any questions, please contact us.